One evening, the Unbearable Beatniks of Light were bemoaning the sorry state of radical culture, and asked themselves what single act they could do to release themselves from their past, while at the same time honoring it. 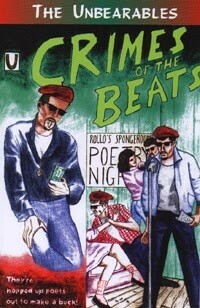 Perhaps put the beatniks, the real beatniks, on trial? Turn the Crimes of the Beats into the Nuremberg of Bohemia: Call out Burroughs for copping W. C. Fields' act, and Ginsberg for being the original Maynard G. Krebs in the gray flannel beretÑalways hyping, hyping, hyping the myth, then selling, selling, selling it as the only viable alternative to the polluted mainstream. And of course Jackie boy himself for claiming that he wrote On the Road in one sitting, a lie that ruined three whole generations of novelists gobbling speed to duplicate the feat of the beat that never really went down in anything short of seven drafts. File under "Literary Criticism."